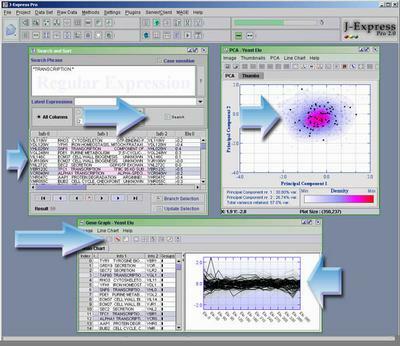 J-Express Pro is a comprehensive portable software package for analysis and visualization of microarray data. The software gives access to methods for unsupervised analysis (clustering etc. ), supervised analysis (SAM, Feature Subset Selection, etc.) and visualisation in an integrated and flexible way. Its efficiency allows interactive clustering of thousands of expression profiles on standard personal computers. Supervised analysis can be performed on samples by simple user-guided sample annotation or on genes through tools for metabolic pathway analysis and Gene Ontology mapping.